In the world of Marketing, the landscape is split into several kingdoms, and in each, a leader is at the helm. Which of the marketing houses do you belong to, what role should you play, and what’s the winning strategy? 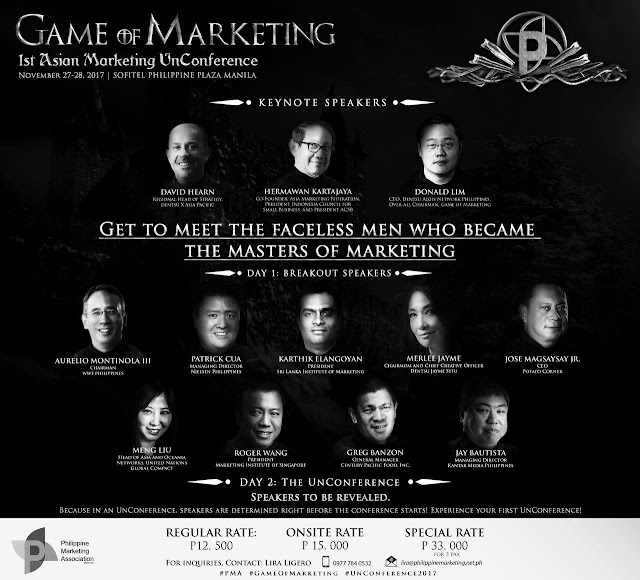 The Philippine Marketing Association, the team that brought you the successful Fifty Shades of Marketing in 2015, invites you to the first ever UnConference in Asia and the Philippines, Game of Marketing. “I am proud to organize the first Asian UnConference, an unstructured marketing conference where topics are discussed, voted on, and decided before the conference officially starts. We are spicing up this UnConference by playing around with the most popular TV series, Game of Thrones, to which we aptly reapplied and called our conference "Game of Marketing". GOT fans would understand the many marketing learnings in the series, and we intend to bring that to life in this first of its kind UnConference. We have invited the best Asian speakers and facilitators for this first of its kind event. If you haven't attended an UnConference, or simply a GOT fan who is in marketing, you simply cannot miss this UnConference!” says Donald Lim, Country CEO of Dentsu Aegis Network Philippines, CPM Asia Pacific, and Over-all Chairman of the 48th PMA National Marketing Conference. Kicking off the first day is a pair of masterclass Opening Keynote speakers; David Hearn, Regional Head of Strategy, dentsu X Asia Pacific and Hermawan Kartajaya, Co-Founder of Asia Marketing Federation, President of Indonesia Council for Small Business, and President of ACSB. Adding to this line up of Marketing Greats is Merlee Jayme, Chairmom/Chief Creative Officer of Dentsu Jayme Syfu who will introduce to you the Three Dragons of Creativity, Meng Liu, Head of Asia and Oceania Networks of United Nations Global Compact, together with Aurelio Montinola III, Chairman of WWF Philippines, will discuss Winning the Iron Throne with Sustainability. Donald Lim, Over-all Chairman of the 48th PMA National Marketing Conference, closes the UnConference as the Closing Keynote speaker. “In the Game of Marketing, selfishness and greed may win some battles, but the war is always won by those who create meaningful engagements and solid relationships.”, added Mark Vincent Co, Executive Vice President of the Philippine Marketing Association, CPM Philippines. So, what are you waiting for? Fight for the coveted throne, and claim your seat at this meeting of marketing minds. Leave the conference equipped to face the wild life of Marketing beyond the wall. This UnConference is supported by our Event partners’ AQA, Avanza, CAT PR, Dentsu Aegis Network, Vitalstrats, Knight Carlo Rossi, Media Partners’ Viva, Solar -ETC, Philippine Daily Inquirer, Business World, Manila Bulletin, Philippine Star, The Manila Times, Manila Standard, Mellow 94.7, Manilastandard.net, WhenInManila.Com, Globaltronics, and MacGraphics Carranz. “Game of Marketing”, the 1st Asian Marketing UnConference will be held on November 27 & 28 at the Sofitel Philippine Plaza CCP Complex Roxas Blvd Brgy. 76, Pasay City. Learn more about Game of Marketing, visit https://www.facebook.com/GameOfMarketingPMA/ or contact Ms. Lira Ligero at 0997-7840532 or e-mail her at lira@philippinemarketing.net.ph for inquiries.